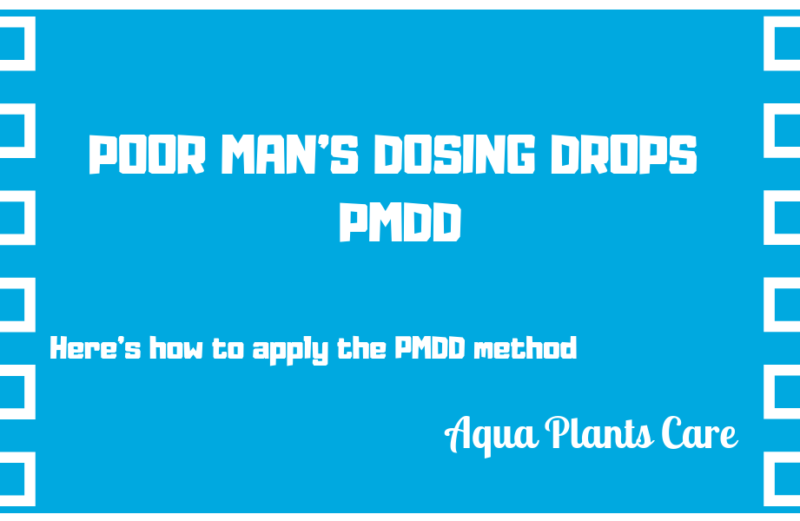 The PMDD method was developed with a double goal: to grow plants and to control algae. After various tests and studies, it was hypothesized that all types of algae (including cyanobacteria) can be controlled in planted aquariums, making sure phosphates are a limiting (and controlled) factor for plant growth. Managing algae in a planted aquarium is a type of vicious circle: algae will compete with plants for nutrients. Plant growth can be significantly slowed down if nutrients do not occur in sufficient quantities. This is the situation that inevitably promotes algae. But plants can not grow without phosphates (the lack of this element is worse than the excess). Therefore, it is necessary to try to reduce the concentration of phosphates in order to keep the planted aquarium with the least amount of algae. The PMDD method aims to maintain a slight excess of light, CO², N, K and trace elements, in order to allow plants to achieve optimal growth and use all available phosphates. Assuming there are no reliable and inexpensive tests to check all the nutrients, a “standard principle” has been established that applies to the majority of planted tanks. In this case, various elements are defined as the percentage of measurable nutrients, i.e. the NO3 test for the mixture of macroelements and iron in the mixture of micronutrients. 500 ml of osmotic (or boiled) water. 33 g of MgSO4 (to be reduced if the mixture of micro nutrients contains a sufficient amount). To simplify dispensing of various elements of this method, they were combined into 2 solutions. Each of these solutions can be easily measured using two “standards”: iron for microelements and NO3 for macroelements. This makes fertilizing management much easier. In the case of the mixture of microelements, a sufficient mixture should be added to keep the iron level at around 0.1 ppm. The best way to check this level is to regularly check the iron level (once a week). At the macro-nutrient level, measure the level of nitrate and adjust the amount of mixture that is injected to maintain the concentration in the aquarium from 3 to 5 ppm. It can therefore be assumed that other macroelements will be brought and consummated optimally. The ideal is to dose a fraction of the weekly dose each day to avoid the lack of nutrients. On the other hand, as with other methods of fertilization, care should be taken to ensure that nutrients do not accumulate, because an excess of some trace elements may be toxic to plants and fish, or at least it can slow down the growth of nutrients for plants. Blocking the assimilation of another element. Thanks to regular and constant water changes this type of problems can be avoided. It is good to change 20-25% of net value per week. After a certain period of using this method, we will completely exhaust the available amount of phosphorus. In this case, and only if plant growth decreases when all parameters are optimal (other nutrient levels, light and sufficient amount of CO2), phosphates in the form of KH2PO4 should be added to keep the PO4 rate between 0 ppm and 1 ppm.